All materials exist as a solid, liquid or gas. The particles in solids, liquids and gases are all arranged in different ways. -Liquids take the shape of their containers. 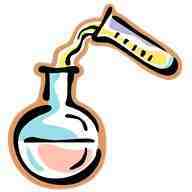 -Liquids have a definite volume. -Liquids cannot easily be compressed. -Liquids are quite difficult to control. Liquids : The particles in a liquid are very close together, but they don't hold onto each other very strongly. The particles in a liquid are always moving around each other, but with no pattern and changing places all the time. Therefore, liquids flow so easily and can take up the shape of the container you put them in. Because the particles are very close together you cannot squeeze a liquid into a smaller space.